IR Speaker Series: Dan Reiter, Ph.D.
A talk by Dan Reiter, Ph.D. 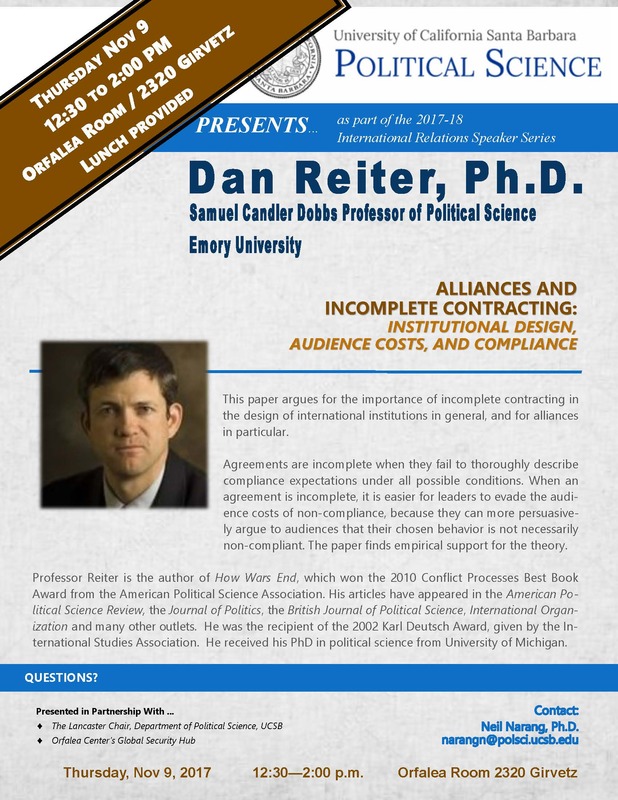 Professor Reiter's paper argues for the importance of incomplete contracting in the design of international institutions in general, and for alliances in particular. Agreements are incomplete when they fail to thoroughly describe compliance expectations under all possible conditions. When an agreement is incomplete, it is easier for leaders to evade the audience costs of non-compliance, because they can more persuasively argue to audiences that their chosen behavior is not necessarily non-compliant. The paper finds empirical support for the theory. Professor Reiter is the author of How Wars End, which won the 2010 Conflict Processes Best Book Award from the American Political Science Association. His articles have appeared in the American Political Science Review, the Journal of Politics, the British Journal of Political Science, International Organization and many other outlets. He was the recipient of the 2002 Karl Deutsch Award, given by the International Studies Association. He received his PhD in political science from University of Michigan.